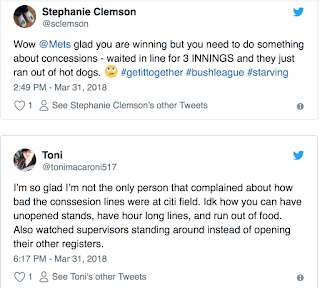 TheMediagoon.com: Mets, Customer Service, Aramark, and Home Opening weekend. Mets, Customer Service, Aramark, and Home Opening weekend. For as long as I could remember Opening Day/Week(end) has alway been slow with the how fast the staff is. I get that there is a time to train and to get into the swing of the season. I am going to use Metspolice.com and @metspolice for a lot of these incidences. Come on Aramark. Why isn't this stuff checked out? Were peanuts sold at the NHL Winter Classic? Who was checking this inventory? Anyone check any of the other perishable food? 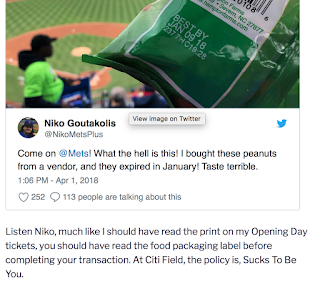 Niko should have been tweeting @aramarksports and @aramark as well as the @mets to bring this to their attention. I have never been a fan of Aramark. They took over the St John's cafeterias when I was in college and nothing was ever done right. So I will give the @mets a pass on this one. @aramarksports not so much. Niko, sorry buddy but them being "nice" has nothing to do with it. They messed up, they should give you an edible product. It pains me to say this but Tezza is right. (I hate saying Tezza is right about anything). 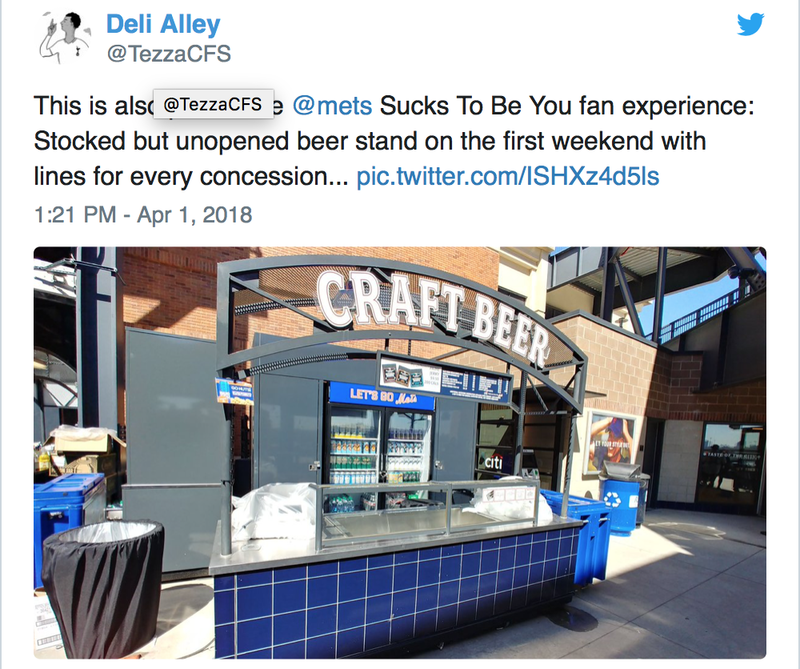 The Mets have a "sellout", so why aren't all the kiosks opened? Want to cut down on lines? Open more kiosks and stands. The post that started Shannon off on Metspolice.com this season. 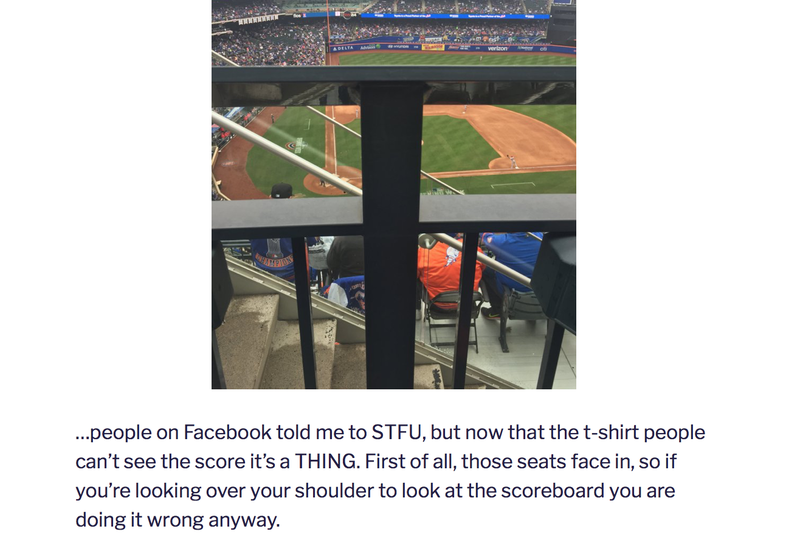 The Mets are known to have bad views in the promenade deck. According to Dave Howard(formerly the guy in charge of Citi Field day to day operations in the past) it was the "geometry of the ballpark". In other words it was poor design. Now I am not going to focus on the view itself but the fan experience staff. Shannon was trying to figure out if there was anyway he could get away from this view. He want to the F.E. guys and the first one he went to couldn't even be bother with him. That's mistake number one. 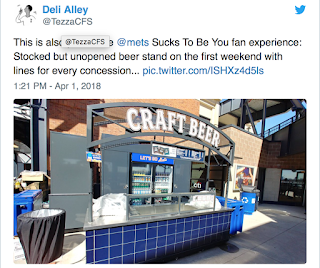 You are working with paying customers who you are trying to retain and that way they come back which makes it necessary for the Mets to keep you to have interactions with fans. Just don't blow off the fan. Ask for your supervisor and at least it looks like you tried to help out even if nothing gets done. It's not that hard to do. Shannon called out Chris Brown who is Vice President, Guest Experience & Venue Services. I know Chris Brown and Chris wants fans to have a good experience at the stadium. He knows guest relations helps retain fans and makes them feel more then a dollar sign. Shannon and Chris are supposed to be talking about what happened on Opening Day and I can't wait to see how this is resolved. Let's see what else we have going on. How do you run out of anything on Opening Day/Week(end). That's unfathomable to even think that. Again @aramarksports @aramark how do you let something like this happen? 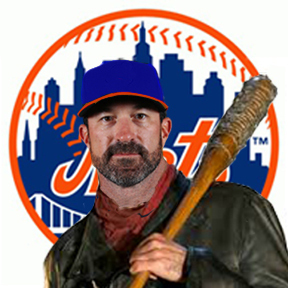 @Mets you better get on these guys a bit to step up their game not to make you look bad. You guys are going to take the brunt of it. I myself had an issue with the Jim Beam Club formerly the Promenade Club's food line. It's one line to get all the different foods that are there. You have the new Racclette, Arancini Brothers, Lil Sweet Chick, Big Mozz, and also Chomp Donuts. On Saturday Raclette was holding up the line. Not one of the five folks working behind the counter had used their head to tell folks "Hey, if you are not standing on line for Raclette, step around and we can help you with your order." I missed 2 innings myself with the line until I was close enough to see what was going on and said to the workers behind the counter," I don't want the Raclette, I want a chicken sandwich, do I have to stand on this line stuck behind people that want Raclette?' No you can come around. " Hey anyone on line in front of me not waiting for Raclette? No? okay." And I jumped the line. Why didn't any of the Aramark employees or their supervisors know to do that? Poor training in my eyes there. 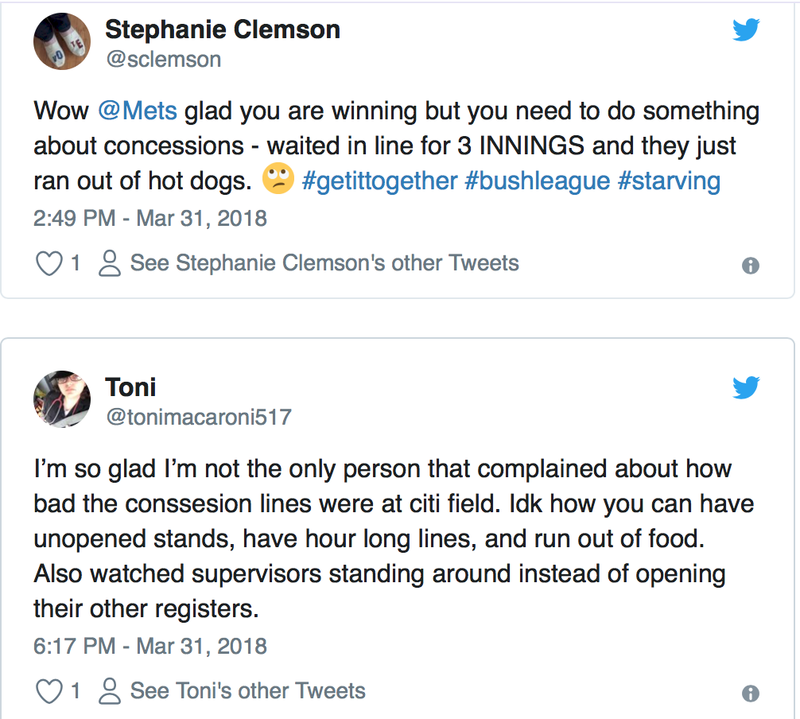 Hey Mets, just like I harp on the people who walk down during At Bats and don't wait for in between batters, this could be something that brings Metspolice and TheMediagoon to team up about the wrongs going on in the stadium this season. Hopefully the new crew is getting training on non game days. This is All certainly pathetic, but it requires supervisors roaming and pushing people. I remember last summer waiting in l8ne 2 innings for ice cream because no one could figure out how to refill the soft serve machine? There will not be training on non-game days, though. Is that a joke? They barely pay the vendors enough to be there on game days; you think they are coming in for free on a day with nothing to sell?